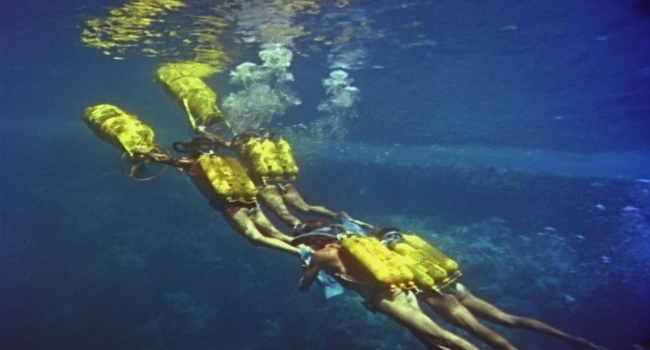 For better or worse, there’s a tremendous sense of fun in Jacques Cousteau & Louis Malle’s seminal The Silent World. I have long known of Jacques Cousteau and his pioneering technology through my father, he transferred his childhood interest of diving and the oceans onto me. Despite this, I was not aware that Cousteau and his team were the subject of several feature-length documentaries with two Academy Awards and a Palme D’or to boast of. When I stumbled upon The Silent World in a CEX shop, I was immediately attracted to the idea of seeing the ocean through the wonderful vibrancy of Technicolor – it was one of the first films to create such an experience. The documentary follows Cousteau, his crew and a lucky little Dachshund aboard the Calypso. They may grow tired in the oppressive sunlight and absence of activity when they’re travelling across the vast, lonely stretches of ocean, but it is all proved worthwhile when they get into the water. Using Cousteau’s Aqualung, the men swim around with relish, in one instance encircling a sponge diver heaving along in a metal helmeted diving suit that today we see only in tacky gold fish bowls. The man hiding in his relic of a suit doesn’t mind the aqualung upstarts, the men shake hands and scour the seabed for sponges together. The greatest liberation however is afforded by their rotary propelled underwater vehicles. They glide among an array of wildlife with ease, including a sea turtle, with one diver seizing the opportunity and hitching a ride on the majestic animal’s back until it’s exhausted – it all looks thoroughly enjoyable until he overstays his welcome. You never see David Attenborough having this much fun. Indeed, the documentary regularly reminds you of the age it comes from – they provoke most of the animals they encounter! When they happen across the group of whales, the skipper decides to try and harpoon one with little success, Cousteau narrates: ‘Under our skipper’s nose is a whale sixty feet long and he can’t resist having a crack at it’. Soon after this, the Calypso’s propellers mortally injure a small whale and the crew mercifully kill the profusely bleeding animal. The men proceed to brutally catch the sharks, tearing their mouths open as they yank them on board, battering some of them with the blunt end of an axe. Marine biologists would abhor such attitudes and behaviour today, however like with the lobsters and flying fish earlier in the film, the Frenchman probably made good use of them in the kitchen. The little Dachshund is used to such sights. No animal is left unpestered, even land animals aren’t safe. When the men arrive at a desert island, they meet a group of giant tortoises and sit and stand on them as they casually eat their lunch. The men’s irreverence seems to leave an impression on the Dachshund, as he is seen nipping at the legs of a poor tortoise trying to mind his own business. Their cavalier style also sees them blowing up part of a coral reef and collecting the detritus in the name of science – it’s an awfully destructive approach to taxonomy. The crew restore your faith in them somewhat when they befriend ‘Ulysses’, a gregarious eighty-pound Grouper fish who, along with scores of other fish, becomes surprisingly tame when the men present them with a bag of delicious gristle. There are moments where the men contrive conversations to show the viewer the procedures that happen aboard the ship. I use the word contrive because of how awfully stilted the men are, but this is mainly because of the useless dubbing on my Blu-ray, so I’ll give the crew’s acting abilities the benefit of the doubt. 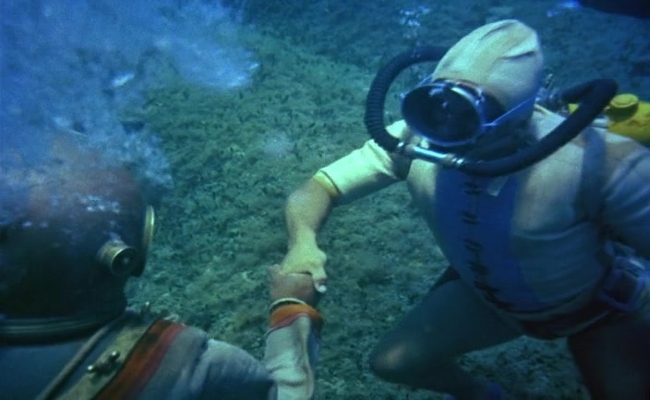 I liked Cousteau’s French-inflected English narration, but I would have preferred subtitles when the men spoke to each other. The Silent World is a charismatic documentary that provides a compelling insight into the history of both diving and underwater photography.